PARSIPPANY, NJ–(Marketwire – Mar 27, 2012) – The Super 8Â® hotel brand is giving racing fans across the country the chance to drive into the winners circle with the Super 8 Road Trip Challenge, an instant win game and sweepstakes offering weekly and monthly race-themed prizes as well as a grand prize of the Ultimate Super 8 Road Trip package. Through November 18, 2012, Wyndham Rewards members in the U.S. who visit www.pettysgarage.com, the official home of Super 8 racing, can play the Super 8 Road Trip Challenge Instant-Win Game. The game challenges players to “drive” around the country, using their computer and mouse, answering as many trivia questions as they can before time runs out. At the game’s conclusion, players find out if they’ve won an instant prize and receive an entry into the sweepstakes. Fans can play the instant win game once daily and have the option of entering the sweepstakes without playing the game. Full terms and conditions are available at www.pettysgarage.com. The Super 8 Road Trip Challenge is available exclusively at www.pettysgarage.com, the official home of Super 8 racing where the hotel brand touts its sponsorship of Richard Petty Motorsports’ #43 car. In addition to the challenge, fans can keep up with the latest racing news, check schedules, learn about the Petty team, register for special Super 8 discounts and even book a Super 8 hotel for an upcoming race. The Super 8 hotel brand, a member of the Wyndham Hotel Group family of lodging brands, is a chain of economy hotels located throughout the United States, Canada and China. All properties in North America offer complimentary high-speed Internet access, expanded cable television, in-room coffeemaker and SuperStartÂ® continental breakfast. Select properties offer meeting and business facilities, fitness centers, swimming pools and allow pets. Children under 17 stay free with a parent. Super 8 hotels in the United States and Canada participate in Wyndham Rewards, the world’s largest lodging loyalty program as measured by more than 6,500 participating hotels throughout 36 countries worldwide. For more information on Wyndham Rewards, visit www.wyndhamrewards.com. Reservations and information are available by calling (800) 800-8000 or by visiting www.super8.com. Super 8 hotels are independently owned and operated. Super 8 Worldwide is a subsidiary of Wyndham Worldwide Corporation (NYSE: WYN). For more information about hotel franchising opportunities visit www.whgdevelopment.com. I vividly remember the introduction of the first Suzuki Vitara, held in southern Missouri. At the time, it was the first and only SUV offering a V-6 engine; albeit, a woefully under-powered V-6. I liked the car then, and while still a decent smaller SUV, gets lost in what has become a crowded vehicle category. Our test Grand Vitara-a new edition and one of seven available trim levels/models, the Adventure edition is equipped with a long list of standard equipment, including water-resistant seat fabric; the only real change to the Vitara lineup. The available models include the Grand Vitara RWD ($19,499), Grand Vitara Premium RWD ($21,399), Ultimate Adventure Edition RWD ($22,299), Limited RWD ($23,749), Premium 4WD ($22, 849), Ultimate Adventure EditionÂ 4WD ($23,949) and Limited 4WD ($25,249. Whew! Although coming into the marketplace withÂ fare pricing, the Grand Vitara feels dated; a basicÂ SUV with so-so looks. Buyers can feel they are getting a lot of features for their dollar, but have to putÂ up with aÂ rather wheezy 4-cylinder engine, and little support when navigating flat roadways, but an improved unibody chassis. . The powertrain in the Vitara also seems old. Our Adventure edition came equipped with a few options, including very sturdy All-weather floor mats ($125), First aid kit and cargo mat ($115), Premium Metallic paint ($130), and Bluetooth with screen graphics ($250). Safety features on the Grand Vitara Adventure include tire pressure monitoring system, brake assist, ABS, Electronic stability control, Traction control, Side curtain airbags, front seat side impact supplemental airbags, side curtain airbags with rollover sensor and daytime running lights. Power windows, locks and mirrors are standard, as is cruise control, keyless entry with panic alarm, heated front seats, leather wrapped steering wheel, fog lamps, side view mirror with turn signals and 18-inch smoked alloy wheels. Beginning with a basic line, the Vitara came in a 4-door and 2-door model. Born with truck roots, Vitara had a body-on-frame construction, was available in RWD and 4WD and wasn’t a terribly comfortable nor practical offering. Slow to accelerate, lousy on the bumps, and a manual transmission that was difficult to shift, Vitara’s SUV had cramped rear seat room and not a lot of cargo space. From 1999-2004, Vitara offered the 2-door soft top convertible (which was a fun car), with Suzuki’s 1.6-liter, 4-cylinder enginen with 97 horsepower as the base engine. A 2.0-liter 4-cylinder engine with 127 horse was optional on the 2-door Vitara and standard on the 4-door. Both came equipped with a 5-speed manual transmission or 4-speed automatic, with a shift-on-the-fly drive option. There’s not much and everything to say about the new Viper, says High Gear Media. Equipped with cues that evoke thoughts and feelings about the first Viper, with smoother surfaces, similar lines, and some of the bulbous awkwardness, too. But at the same time, it has the size, the low-slung ferocity, and the don’t tread on me stance that all Vipers have had, particularly the last generation, which ended in the 2010 model year. Now, withÂ 640 horsepower, the Viper sportsÂ an 8.4-liter V-10 engine.Â Building on its history with an all-new theme, Viper adds someÂ luxury, more comfort, and lots more control; some of which is mandated, some of itÂ voluntary.Â Custom Pirelli tires measuring 295/355 mm with unique compounds front-to-rear, are the feet to move this powerful Viper; most likely with superb grip. New features on the redesigned Viper include four-stage stability control (which can be turned off), cruise control, two-mode adjustable suspension (via dash buttons, on GTS model), plus the “executive performance driver’s office”–the new, higher-quality interior. Sabelt seats, the same supplier as Ferrari, give custom seats to the Viper, and a huge range of the interior’s colors and materials are customizable to the buyer’s preference. The Dodge Dart instrument cluster was used in the new Viper, although customized specifically to the Viper. For many cars, the track is a somewhat meaningless playground. For the Viper, and other super cars of its ilk, the track is the only place where they can really be themselves; many cars in this category can exceed the legal limit on the highway in first gear. Getting anywhere near their limits is simply not feasible on public roads. For the Viper, which has always been a niche car for a niche market, that’s especially true. 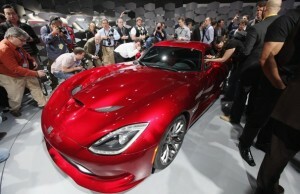 The 2013 Viper is the lightest Viper ever, coming in 100 pounds lighter than the 2010 model. We’ll have all of the official details and information for you shortly, so stay tuned, and in the meantime, check out all of our ongoing live 2012 New York Auto Show coverage. *The legend of powerful 427 Convertibles in the mid sixties is reignited as Chevrolet unveils the latest addition to the iconic Corvette family â€“ the 2013 Corvette 427 Convertible Collector Edition available early summer 2012. Merging design and power with ZR1 and Z06 racing technology, 427 is the ultimate expression of performance, making it the fastest, most capable Corvette Convertible in our lineage. The 427 is a culmination of the first 60 years of Corvette and sets the stage for the future. Available Summer 2012. *CHERRY HILL, N.J., March 29, 2012 /PRNewswire—Subaru introduces the 2013 Outback at the New York International Auto Show. Complete with new BOXER engine with higher power and better fuel efficiency, the Outback features the new second-generation Lineartronic CVT, a redesigned front styling, smoother, quieter ride, among numerous other amenities. The 2013 Subaru Outback will have available EyeSightâ„¢ driver-assist system with: Pre-Collision Braking, System Capable of Pedestrian Detection, Lane Departure and Sway Warning, and Adaptive Cruise Control, andÂ features a restyled front end, with new headlights, grille, front bumper, and fog lights, for a more powerful appearance. Standard Symmetrical All-Wheel Drive distinguishes the Outback from crossover competitors, which generally offer all-wheel drive as an extra-cost option. Numerous enhancements to the body structure, suspension, and steering give the Outback an even smoother and quieter ride for 2013; while also helping increase handling agility. Body roll has been reduced by up to 40 percent. Providing crisp car-like handling with the versatility of an SUV, the 2013 Outback now has 8.7 inches of ground clearance which is higher thanÂ many large SUVs and crossovers, while maintaining a low step-in height, the 2013 Outback 2.5i models debut a new double-overhead-cam (DOHC) 2.5-liter FB series Boxer engine for increased performance and fuel efficiency. The new engine produces 173 hp and 174 lb.-ft. of torque, compared to 170 hp and 170 lb.-ft. with the previous engine. More significant is that the new engine produces greater low-end torque across a broad speed range, making the 2013 Outback 2.5i models more responsive in everyday driving. The Outback 2.5i and 2.5i Premium models offer a choice between a standard six-speed manual transmission and the second-generation Lineartronic CVT (continuously variable transmission); the latter is standard on 2.5i Limited. Models with the CVT also feature a 6-speed manual mode with steering wheel paddle shifters, which allow the driver to control the transmission via six pre-set ratios. Outback 3.6R models continue with a 256-horsepower 3.6-liter six-cylinder BOXER engine and five-speed electronically controlled automatic transmission. Althoughh official EPA fuel economy figures are not yet available,Â Subaru projects that the 2013 Outback 2.5i with the Lineartronic CVT will achieve 24-mpg city/30 mpg highway/26 mpg combined, up compared with the 22/29/24 for the 2012 model. Subaru also projectsÂ the 2013 Outback will achieve a 5-star overall safety rating from the National Highway Traffic Safety Administration (NHTSA). The 2013 Outback models add a new Brake Override system. The 2013 Outback will feature more comfortable seat fabric, and a new light matte wood grain trim provide a sophisticated appearance. The Outback Limited models for 2013 offer a new Special Appearance Package option that provides a Keyless Access & Start system along with a two-position memory system for the already-standard 10-way power driver’s seat. With the Keyless Access & Start system, the driver, while carrying the remote control in a pocket or purse, can unlock the car by touching the door handle button. The rear gate also has an unlock touch sensor. Also in the Limited models, rear A/C outlets have also been added, and a new electro-luminescent instrument cluster integrates the 3.5-in. color screen for the multi-information display, which also shows EyeSight functions when the car is so equipped. The Outback was the first crossover to feature as standard factory-installed foldable roof crossbars. For 2013, a new adjustable design allows the rear crossbar to be moved further rearward to carry longer items such as kayaks or other outdoor gear. Available in three trim levels, the 2.5i models will be available in base, Premium, Limited. The 3.6R models will be offered in base and Limited. The base 2.5i features standard steering wheel cruise control and audio switches; a 60/40 split fold-down rear seat with recline feature; electronic parking brake with Hill Holder System; and an automatic headlight function. The standard audio system in the 2.5i model is upgraded for 2013 to now include BluetoothÂ® hands-free phone capability, audio streaming, iPodÂ® control capability, and a USB charging port. The system continues with an AM/FM stereo, single disc CD player, Radio Data Broadcast System (RDBS), 3.5mm aux. input jack, and 4 speakers. Outback Premium models add a 10-way power driver’s seat; leather-wrapped steering wheel and shifter; body-colored side mirrors; 17-in. alloy wheels (all 3.6R trim lines have 17-in. alloy wheels as standard); and other amenities. The Limited trim lines add to the Premium perforated leather upholstery; dual zone automatic climate control; the All-Weather Package that includes heated front seats and mirrors, and a windshield wiper de-icer (package optional for Premium); the harman/kardon Premium Audio Package (optional for Premium) with a 4.3-in. color display, 440-watt amplifier, nine harman/kardon premium speakers, and standard XM Satellite RadioÂ® service (four-month free trial subscription included); rear A/C duct, electro-luminescent gauges, and a 4-way power front passenger seat. The Limited models also exclusively offer an available voice-activated GPS navigation system with a seven-in. LCD display, rear vision camera and XM NavTrafficÂ® (with a four-month free trial subscription included), and an SD card slot for convenient navigation map updates, among other features. Available inÂ Premium and Limited models will be aÂ Power Moonroof Package with Rear Vision Camera that also includes an auto-dimming rear-view mirror with Homelink garage-remote function. Other features in the new 2013 Outback includeÂ body-colored side mirrors; 17-in. alloy wheels (all 3.6R trim lines have 17-in. alloy wheels as standard); and other amenities. The Limited trim lines add to the Premium perforated leather upholstery; dual zone automatic climate control; the All-Weather Package that includes heated front seats and mirrors, and a windshield wiper de-icer (package optional for Premium); the harman/kardon Premium Audio Package (optional for Premium) with a 4.3-in. color display, 440-watt amplifier, nine harman/kardon premium speakers, and standard XM Satellite RadioÂ® service (four-month free trial subscription included); rear A/C duct, electro-luminescent gauges, and a 4-way power front passenger seat. The Limited models also exclusively offer an available voice-activated GPS navigation system with a seven-in. LCD display, rear vision camera and XM NavTrafficÂ® (with a four-month free trial subscription included), and an SD card slot for convenient navigation map updates, among other features. *It’s good to be a dealer these day. Many even made money on new-car sales last year. Things may be looking up, as the average retail net profit on a new vehicle was $23 in 2011 vs. a loss of $180 in 2010, according to Paul Taylor, chief economist for the National Automobile Dealer’s Association (NADA). The turn around, says Taylor, can be attributed to an improving economy, fewer dealerships competing and low interest rates. Overall, the average dealership made $785, 855 in net pretrax profit in 2011, a record amount since NADA began tracking the data in 1970. The year’s faster than expected sales recovery has entered a new phase: “Want” buyers are joining the “Need to Replace” buyers who have been carrying the market. Pent up demand has been unleashed, say dealers and analysts. It is easier for customers to get financing, says Nissan Division sales boss Al Castignetti. *According to Dan Knott, Chrysler’s head of purchasing, Fiat suppliers will likely win business in the U.S. as Chrysler introduces Fiat-based vehicles. The first Chrysler Group vehicles on a Fiat platform will be the 2013 Dodge Dart compact, launched soon out of Chrysler’s Belvidere, IL plant, and the replacement for the Jeep Liberty SUV (Toledo North plant-currently undergoing a $500 million renovation). *March 22, 2012: ZipCar, Inc. is adding five Chevy Volt vehicles to its fleet which will be the company’s launch of its first large-scale electric vehicle pilot program. Arriving in 2006, ZipCar now has 450 vehicles available in more than 275 locations, with plans to add up to 20 electric vehicles to Chicago by the end of 2012. Pricing to reserve the Volt will start at $10/hour; pricing for other vehicles ranges from $7.75-$15.50/hr. Chicago was chosen as the inaugural location for the electric vehicle program in part, due to the city’s efforts to install a public charging infrastructure. In charge of the electric vehicle initiative is LA-based 350Green, LLC; to the tune of $8.9 million. The project calls for 280 charging stations in Chicago and suburbs. The majority of ZipCar members make trips of under 35 miles, which is the gas-free range for the chevy Volt. The Volt switches to a gas generator and can go 375 miles on a full tank of gas. *March 20, 2012: Land Rover will celebrate a milestone at the New York Auto Show this year. Hosting the 25th Anniversary celebration, Land Rover will invite consumers to an urban off-road adventure where they will drive 2012 model year vehicles at a custom-made course in the heart of New York City’s meatpacking district. At the time of its launch in 1987, the Range Rover created a new automotive market segment now referred to as luxury sport utility. At the time, the retail price of $30,850 made it the most expensive vehicle of its type. Since 1987, more than 575,000 Land Rover vehicles have been sold in North America. In the past quarter century, Land Rover has grown its presence in the U.S., while at the same time gained wider acceptance among car shoppers. By all accounts, a successful brand with a loyal following, Land Rover established itself with the introduction of the original Range Rover (known as the “Range Rover Classic”), creating a new market segment for dual-purpose vehicles that could go almost anywhere and has been the platform for numerous technological innovations in the industry. Land Rover’s second model, the Range Rover was created in 1970. Frequently featured in movies, TV shows about African exploration, and world news coverage, Land Rover was often the vehicle of choice for teams bringing humanitarian relief in war zones or natural disasters. Its latest success story is the award-winning 2012 Range Rover Evoque, the company’s lightest and most fuel-efficient SUV ever. The all-new Range Rover Evoque has received over 90 international awards including the 2012 ‘North American Truck of the Year’ and the 2012 Motor Trend ‘SUV of the Year.’ With 2011 sales up a remarkable 20 percent, Land Rover in North America scored the largest improvement, percentage-wise, of any of its luxury vehicle competitors with total sales exceeding 38,000 vehicles. The outlook for the company in this its 25th anniversary year is strong and confident,” said Andy Goss, President, Jaguar Land Rover North America, LLC. “Our current product line-up is the strongest we’ve ever had and the U.S. consumer strongly embraces our brand. The deeply ingrained corporate values and dedication to the brand that were instilled by the original management team 25 years ago has served Land Rover well. Today, there’s a renewed focus, enthusiasm and energy within the company,” Goss said. *Stuttgart’s new sports car SUV has been named “Macan.” The name comes from the Indonesian word “Tiger” and combines suppleness, power, fascination and dynamics. Combining all sports-car characteristics, the new Macan is a “genuine porsche,’ says Executive V.P. Sales and Marketing Bernhard Maier. The Macan will become the fifth Porsche model line and is expected to do as well as the Cayenne SUV. The new SUV will come off the production lines in Leipzig in 2013, from the plant that is being expanded into a fully-fledged production plant in Saxony, with body assembly line and paint shop capabilities. Investing $500 Euro into this biggest building project in Porsche’s corporate history, the auto maker will be creating another 1,000 jobs. *LAS Vegas-Line up gals for the lastest in Vegas offerings: Special gun-shooting holidays for divorced women. Newly single ladies can take out thier pent-up anger at their ex with Machine Gun Vegas’ latest package called “Lady Killers.” First-time female shooters can let their bullets fly as they fire off 25 rounds on an Uzi fully automatic machine gun and choose 20 rounds. Typically used as a personal defense weapon for tankers, artillary troops and officers, these women can now use it to get back at their ex! Ladies can also use a handgun for 20 rounds, including a Sig Sauer 226, Glock 17 or Springfield XDM 9mm. Just 10 minutes from the famous strip, the package for Femme Fatales is just $89.95 and takes place in a 10,000-square-foot facility featuring 16 shooting lanes, and a Gun-lounge. Follow MGV on Twitter @VegasOnFullAuto, or FB at facebook.com/machinegunsvegas. *Ford: Using voice commands, drivers can make calls, hear incoming text message, get news updates. *General Motors: Drivers can fool with a 7-inch, high-resolution touch screen and can also get text messages and audio streaming from smartphones. *Tesla Motors: Model S will be equipped with Internet access and 17-inch touch screen. *Mercedes-Benz: Voice-activating system for radio, phone, navigation; comes with Facebook app. *BMW: Internet access, on-demand music streaming and viewing of videos on iPhone. Hyundai keeps churning out winners and it appears they have yet another one in the 2012 Velostar. Clearly aimed at the younger driver, the Velostar offers a lot for a very reasonable price. Staring at $17,300, our test Velostar came equipped with a host of standard equipment and just one option: the Style Package, complete with 18-inch alloy wheels and P215/40R18 tires, Chrome grille surround with plano black highlights, front fog lights, panoramic sunroof, plano black interior accents, Dimension Premium Audio with 8 speakers, external amp and subwoofer, leatherette bolster seats and door inserts, leather-wrapped steering wheel and shift knob, alloy pedals, and drive auto-up window, $2,000. Available in both 6-speed manual and automatic Dual Clutch Transmission (DCT), Velostar gets respectable fuel economy (28/40/32 M/T; 29/38/32 DCT), is fairly comfortable and considerably spunky. However, be careful not to bottom out when navigating city streets. There isn’t a lot of play when hitting a pothole, so it’s best to make every effort to avoid them. The panoramic sunroof is handy and takes care of both front and rear passengers; if your riders like that kind of thing. Some don’t, of course, as it feels to them as if they are in a convertible. Well, sort of. The standard equipment, as with all Hyundai models, is plentiful and includes Electronic Stability Control w/traction, ABS with electronic brake-force distribution and brake assist, A/C, AM/FM/XM/CD/MP3 audio system with 6 speakers, In-car Web or Smartphone app, Hyundai BlueLink Telematics System Technology, 7-inch multimedia touchscreen, trip computer, power windows/locks/heated mirrors, remote keyless entry with alarm, steering wheel-mounted audio controls, cruise, phone controls, integrated Bluetooth hands-free phone system, tilt/telescopic steering column, driver seat heigh tadjustment, front armrest storage box, and 60/40 split-folding rear seat. The Hyundai Velostar incorporates a host of sophisticated technology typically found on higher-end vehicles. Nice amenities on the Velostar include a front passenger seatback pocket for all that extra gear, and that full tank of gas helps out these days too! An innovative available rearview camera can be opted for on the new Velostar. With images displayed on the touchscreen monitor, the actual camera lens is mounted in the back latch on the rear hatch. Pretty cool. Also different and distinctive on the Velostar are the LED headlight accents that flank the grille. The accents plus a beveled hood with dual scoops make the Velostar’s style stand out. Another available option on the Velostar is Hillstart Assist Control, an anti-gravity device, standard with the DCT system that helps to minimize backward rolling when starting from a stop or steep hills. On first glance, one assumes Velostar is a two-door model, when in fact, it has a secret third door on the passenger side. This 3-door design is somewhat hidden in Velostar’s aggressive lines, but certainly makes climbing in/out of the rear seats a lot easier. Hyundai Velostar incorporates the Active EcoSystem to improve fuel economy. The EcoShift DCT system helps to deliver smooth and efficient power. The Velostar is equipped with a sport-tuned suspension, a modified front suspension and gas-charged hydraulic shocks, all adding to a sportier ride. Motor Driven power steering is tuned for increased steering response, and large front and rear stabilizer bars reduce body roll, while improving handling and control on curves. Complaints? Just a few. The ride is somewhat harsh in the Velostar; well, sporty. Navigating bumps is a little hard on the posterior. And the doors are heavy, which is often the case with a coupe-style vehicle, even though the Velostar does have that 3rd door on the passenger side. On the other hand, the sound system in this little runner is excellent, the sunroof enormous and the wheels very attractive. The Velostar offers very pleasing styling. For a fun, very fairly priced sporty car, we encourage you to take the Hyundai Velostar for a spin. Similar to Nissan’s Juke, the Velostar appeals to all age groups. The Mazda3 4-door sedan and hatchback models are available in plenty of editions to suit everyoneâ€™s fancy, including the iSV ($15,200), i Sport ($16,845), i Touring ($18,700), i GrandTouring ($22,550), S Touring ($21,300) and S Grand Touring ($22,900). Â Engine choices include Mazdaâ€™s 2.5-liter, 155 hp., and the 2.0-liter, 148 hp. Engine. Our test car was the I Grand Touring edition, just about in the middle of the offerings. With a starting price of $22,300, the I Grand Touring model has a long list of standard equipment; ours came equipped with two options: Interior lighting kit ($200), Technology Package (Bi-Xenon headlights w/auto-leveling/pivoting adaptive/front lighting system, Blind spot monitoring system, Sirius Satellite radio w/4-mth. Subscription, perimeter alarm, rain sensing front wipers, $1,400), and Compass mirror/Homelink $275). The standard equipment list included such amenities as tilt & telescopic steering column, leather-wrapped steering wheel with audio/cruise/Bluetooth controls, power windows/locks, leather-trimmed seats and door panel, inserts/carpet floor mats, 8-way power driverâ€™s seat, heated front seats with several settings, leather-wrapped shift knob and two 12V power outlets. Safety equipment on the Mazda3 sedan includes remote keyless entry, â€œcrashableâ€ brake pedal, 4-wheel disc brakes, ABS braking system, front/rear side air curtains, â€œTriple Hâ€ body construction, tire pressure monitoring system, collapsible steering column, anti-theft immobilizer, traction control system, dynamic stability control, advanced dual frontÂ and front side-impact airbags. Competition for the Mazda3 includes such vehicles as Hyundai Elantra, Honda Civic and Toyota Corolla. While all three have a similar ride quality, the Mazda3 is sportier and more firm, and offers a fairly smooth, quiet ride. More standard features were added on the 2011 model, making the Mazda3 a better value. While all models have the stability control feature, the I Grand Touring edition now offers the formerly optional Bose audio system and sunroof as standard equipment. We like the s Sport and s Grand Touring hatchback models; especially those equipped with manual transmission. Sporty, fun-to-drive and agile, these littlecompacts provide lots of driving entertainment.